Smart style, this box set by Emporio Armani is ideal for the modern man. With a bold midnight blue dial sets the scene for this sleek timepiece, with a silver tone Armani eagle at the 12-o-clock position, a stainless steel bracelet completes this watch. 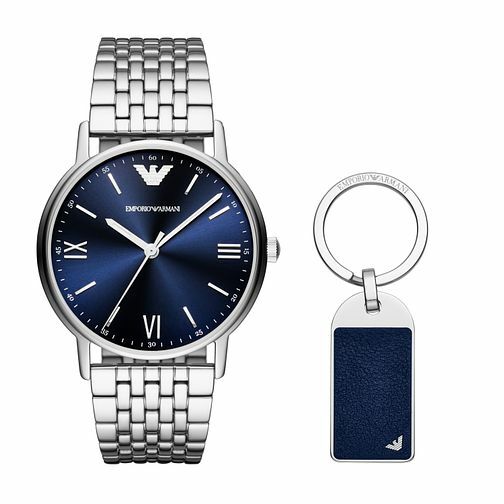 The co-ordinating keyring presents a stainless steel body, with engraved Emporio Armani name and logo upon the ring, with the charm boasting a midnight blue panel complete with signature eagle. This box set is presented in a smart giftbox, making for the ideal present. Emporio Armani Men's Stainless Steel Watch & Keyring Box Set is rated 5.0 out of 5 by 1. Rated 5 out of 5 by Anonymous from Beautiful watch Lovely looking watch for my partner’s birthday. Arrived really quickly and beautifully presented. A very reasonable price for a fabulous watch.